Our biggest book yet with gorgeous routes in every major neighborhood, 150+ miles along paths, parks, aqueducts, and greenways, 75+ miles along the water and running “tours” of historic areas, universities, and some real hidden gems! The definitive guide for running in Boston: historic neighborhoods; 50+ miles along the water, including the entire HarborWalk; all sections of the Emerald Necklace; and other scenic gems! 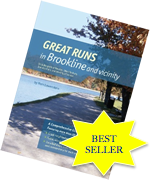 More than 25 “themed” runs through Brookline’s beautiful neighborhoods, ponds, parks, and pathways. Includes jaunts into Newton, Jamaica Plain, West Roxbury, and Boston. Ever notice all the guide books for biking, hiking, and other outdoor activities? Well, runners finally have a resource: The Great Runs series. Our mission is to introduce the great routes and hidden gems near you.